Ypsilanti Township 2040: After a three day workshop including two open houses and a pancake breakfast, we are now in the process of formulating the actual plan. Yankee Air Museum (YAM) – 1 Liberator Way: The Yankee Air Museum proposes renovation of the existing historic Willow Run bomber plant with a building addition including a conference center. The Township is currently waiting on YAM to submit a revise PD Stage I and II for review. American Center for Mobility (ACM) – 2930 Ecorse Road: Located on the site of the historic Willow Run property, the American Center for Mobility is a testing, research and certification center for the next generation of automated vehicles. With features like double overpasses, railroad crossings, highway loops, and a tunnel, the site provides a cost-effective way to replicate real-world situations in a single location. The estimated investment into the community has been stated at over $120 million. 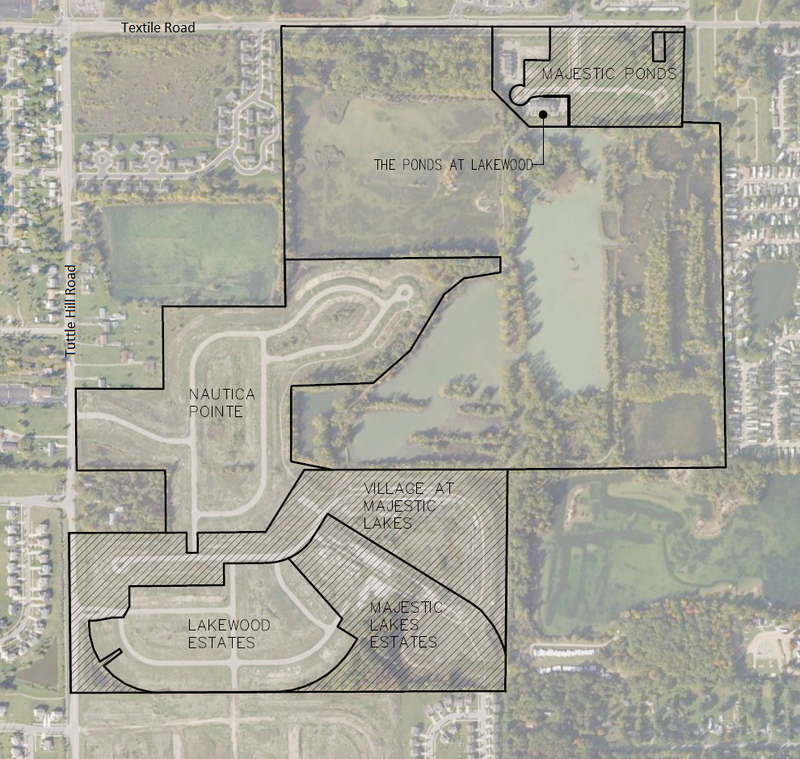 An additional final site plan amendment is expected for the Technology Park. Phase 1A of this project has final site plan approval. The Amendment for Phase 1A Campus Build-Out preliminary site plan was approved conditionally at Planning Commission on March 13th, 2018. The final site plan was approved at the May 10th, 2018 special Planning Commission meeting. The pre-construction meeting took place on May 15th, 2018. Restaurant Depot – 1347 James L. Hart Parkway: This project is a 51,234 square foot wholesale distribution building on an 11.416 acre parcel. Over 100 Restaurant Depots operate in 28 states, selling groceries, supplies and equipment to the food service industry. The facility’s primary customers are restaurants, delis, caterers, pizza shops and not-for-profit institutions. The project was approved by Planning Commission on December 12, 2017. The project received administrative final site plan approval on March 21st 2018. The pre-construction meeting took place on April 3rd, 2018 and construction is currently underway. The temporary Certificate of Occupancy was issued. Landscaping and minor engineering is to be completed spring 2019. Cell Tower - 6400 Textile: Cell tower was approved by the Township Board on March 6th, 2018. Final site plan was approved on April 30th, 2018. Construction started on June 18th, 2018. As of August 15th, 2018, all grading and aggregate surface placement was complete, however, placement of topsoil and restoration remained to be completed. Kalitta Air, Brake, and Tire Expansion - 10990 Blackmore: The proposed project consists of a 12,000 square foot addition to an existing 12,000 square foot building at 10990 Blackmore Avenue. Kalitta Air uses this facility for repair, warehouse and storage. The proposed addition is for additional repair, storage, and warehousing area. The addition is located on a paved section of the existing site within a fenced area. Additionally, the applicant proposes to relocate an existing storage shed to a grassy area adjacent to the northwest corner of existing parking lot. There is no outdoor storage at this facility. The project was approved conditionally at the March 27th, 2018 Planning Commission meeting. The pre-construction meeting took place on July 27th, 2018. The project is complete (silt fence to remain until spring). Meade Dental Office – 2780 Packard: The Meade Dental Office is a proposed 7,095 square foot dental office building at 2780 Packard Road. The project received final site plan approval on May 2nd, 2018. The first pre-construction meeting took place on June 11th, 2018. Due to a change in contractors, a second pre-construction meeting was held on July 23rd, 2018. Construction on the site is underway. Huron Valley PACE – 2940 Ellsworth: Construction in currently underway for the UMRC Huron Valley expansion to their 23,700 square foot existing facility at 2960 Ellsworth Road. The applicant proposed to expand their existing 23,700 square foot facility by an additional 23,400 square feet, expand the parking lot, expand the drop off area, and make other general site improvements. The parking lot expansion includes construction of an additional 57 spaces, and additional 33 “landbanked” parking on the site plan. They have triggered the landbanked deferred parking due to leadership changes, employment, and expansion and will be constructing this section at this time. Senior adults are picked up by PACE transportation and driven to the facility for social, wellness, and medical care services. There are no overnight accommodations at the facility. The current facility accommodates 127 clients and 57 full time employees. With the addition, the facility will serve 156 clients and staff 98 full time employees. The temporary Certificate of Occupancy was issued. Landscaping and minor engineering is to be completed spring 2019. Round Haus Party Shoppe – 5970 Bridge Road: An application has been submitted for the demolition of the existing convenience store, which is 3,290 square feet in floor area, and the construction of a new 6,000 square foot retail building along with a 4 pump island fuel station on the parcels located at 5970 Bridge Road and 10191 Textile Road. The proposed construction would take place on what are now two separate parcels, which would be combined to form one 0.83-acre parcel. A preliminary site plan and a special conditional use permit for this project were approved with conditions by the Planning Commission on June 28, 2016. Subsequently, two dimensional variances were approved with conditions by the Zoning Board of Appeals on July 20, 2016. The special conditional use permit and variances are still valid since these approvals run with the land. The preliminary site plan approval expired since construction did not commence within one year of approval. The applicant is now reapplying for preliminary site plan approval. Sunco Quick Oil Lube - 2380 East Michigan Avenue: On May 3rd, 2018 we met with the applicant and MDOT to discuss options for the driveway cut issue. At this time, there are a couple options of plan revisions and attempts to make contact with the neighbor at 2340 East Michigan Avenue. We await the third preliminary site plan revision to be submitted. Hampton Inn and Suites – 515 James L Hart Parkway: The proposed project includes an 88- room, 4-story, 54-foot tall Hampton Inn hotel. The site is currently vacant, and directly west of the strip mall that includes the Leo Coney Island, Jets Pizza, and Powerhouse Gym. This item was approved conditionally at the August 28th, 2018 Planning Commission meeting. Detailed engineering plans are under review. Electric Vehicle Charging Station – 2321 Ellsworth Road: The proposed project includes the installation of six (6) electronic vehicle charging stations and accessory equipment within the Roundtree Shopping Center parking lot. This item was approved conditionally at the November 13th, 2018 Planning Commission meeting. The pre-construction meeting is scheduled for January 22nd, 2019. R&L Carriers – 43 Emerick Street: The freight trucking project is currently under preliminary review. Chippea Tennis Club – 2525 Golfside Road: The addition of two indoor courts at the current Chippewa Club is currently under preliminary review. Conditional Rezoning zoning code text amendment: Due to a technicality in the motion, the Planning Commission will need to amend their motion. The Board should see this in April 2019. The new zoning code language will address more detailed policies and procedures regarding conditional rezonings. Ecorse Road zoning code text amendment: In the coming weeks, the Planning Commission and Township Board will consider the new zoning code language to match the 2018 Placemaking Plan recommendations. The new zoning language, once implemented, is also a condition for establishing a CIA (Corridor Improvement Authority) which may aid funding for corridor streetscape and business cohesion. Majestic Ponds: This development includes 37 single family detached units on 50-foot wide lots located adjacent to Textile Road. Majestic Ponds is located next to The Ponds at Lakewood which includes sixteen (16) attached multiple-family units that have already been constructed. PD Stage II plans were approved at the November 22, 2017 by the Township Board. Floor plans and elevations will come back to the Township Board for approval prior to issuance of building permits and construction for those phases. The Planning Department is reviewing elevations and legal counsel is reviewing additional legal documents. Final approval will come before the Board of Trustees shortly. The pre-construction meeting took place on February 22nd, 2019. The Ponds at Lakewood: Approved and constructed development of sixteen (16) attached multiple-family units located adjacent to Textile Road. Nautica Pointe: Approved and under construction development of 142 multiple-family units located adjacent to Tuttle Hill Road. Village at Majestic Lakes: This development includes 115 single family detached units on 60- foot wide lots located adjacent to Tuttle Hill Road. PD Stage II plans and elevations/floor plans were approved at the November 22, 2017 by the Township Board. Legal counsel is reviewing additional legal documents. Final approval will come before the Board of Trustees shortly. The pre-construction meeting for the east portion took place on February 22nd, 2019. Majestic Lakes Estates: This development includes 81 single family detached units on 50-foot wide lots accessed through the Village of Majestic Lakes. PD Stage II plans were approved at the November 22, 2017 by the Township Board. Floor plans and elevations will come back to the Township Board for approval prior to issuance of building permits and construction for those phases. The Planning Department is reviewing elevations and legal counsel is reviewing additional legal documents. Final approval will come before the Board of Trustees shortly. The pre-construction meeting took place on February 22nd, 2019. Lakewood Estates: Approved and under construction development of 62 single family detached units accessed through the Village of Majestic Lakes. If you should have any question or comments as it relates to this report, please contact Charlotte Wilson by contact form or call (734) 544 - 3651.